Searching for a customized Z Channel? Well, you have landed at the right place! We are the Z channel metal fabricator who allows you to configure your Z Channel online. What is a Metal Z Channel? A metal piece cut and bent in the form of a 'Z' . It is used as supports, framing, stiffeners, etc. It gives strength to a structure and helps to provide the desired shape. How to configure your custom fabricated metal z channel online? you already have fulfilled 3 out of the 4 easy steps to configure your sheet metal z channel. In the 4 step you choose the z channel to be configured. 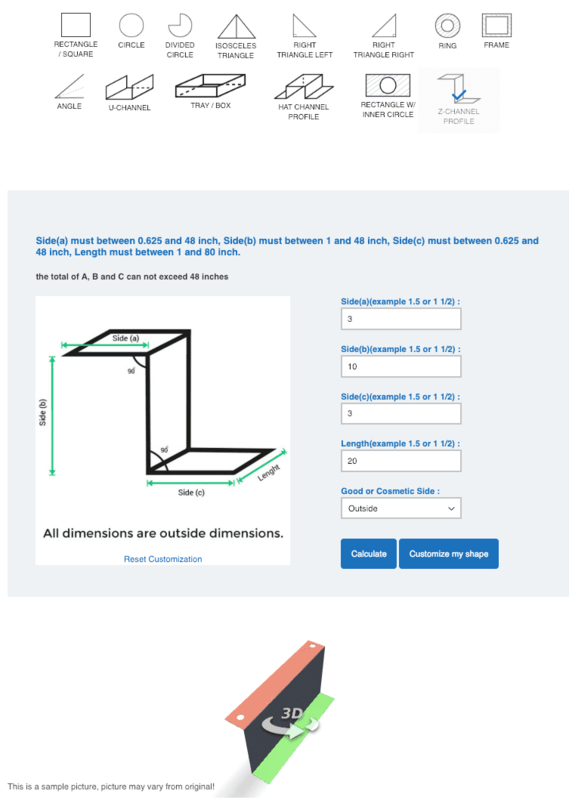 The sheet metal calculator will give you a price for your custom cut metal z channel including the options you have chosen. Why get a Metal Z Channel fabricated by MetalsCut4U? We specialize in providing our customers with custom fabrication sheet metal parts. We are equipped with a wide array of machinery. The metal Z channel is custom fabricated. You determine the size of each side and the total length of the channel. It will be cut to your specifications and bent accordingly. The Z Channel is fabricated to be used in many different areas. 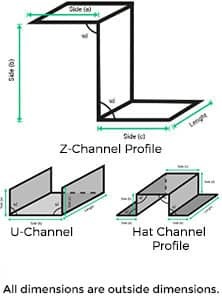 Metalscut4u offers you to configure the Z Channel, made for instants out of aluminum, you really need.Aluminum Z channel is used in framing, supports, tracks, slides, etc. It is also used in industries such as fences, garage doors, window frames, store fixtures, tool boxes, etc. Aluminum Z channel has proved to be environmentally friendly the lightest weight combined with excellent strength. You can also build the Z channel out of stainless steel or carbon steel metal.